“精益英语与翻译培训” 2015 年 5 月份特价体验课：CATTI 3 级英语笔译实务教材解析 – Is More Growth Really Better? 1. 原文：Is More Growth Really Better? 2. 原文：A number of writers have raised questions about the desirability of faster economic growth as an end in itself, at least in the wealthier industrialized countries. Yet faster growth does mean more wealth, and to most people the desirability of wealth is beyond question. “I’ve been rich and I’ve been poor — and I can tell you, rich is better,” a noted stage personality is said to have told an interviewer, and most people seem to have the same attitude about the economy as a whole. To those who hold this belief, a healthy economy is one that is capable of turning out vast quantities of shoes, food, cars, and TV sets. An economy whose capacity to provide all these things is not expanding is said to have succumbed to the disease of stagnation. 3. 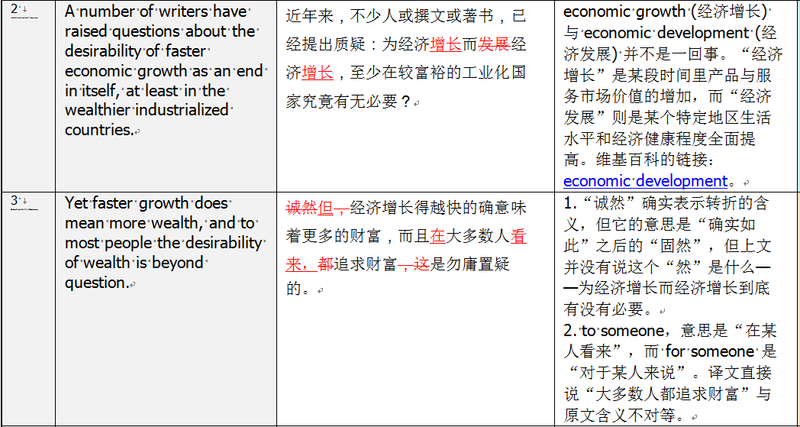 原文：Economists from Adam Smith to Karl Marx saw great virtue in economic growth. Marx argued that capitalism, at least in its earlier historical stages, was a vital form of economic organization by which society got out of the rut in which the medieval stage of history had trapped it. Marx believed that “the development of the productive powers of society. . . alone can form the real basis of a higher form of productive powers of society”. Marx went on to tell us that only where such great productive powers have been unleashed can one have ” a society in which the full and free development of every individual forms the ruling principle. “In other words, only a wealthy economy can afford to give all individuals the opportunity for full personal satisfaction through the use of their special abilities in their jobs and through increased leisure activities. 4. 原文：Yet the desirability of further economic growth for a society that is already wealthy has been questioned on grounds that undoubtedly have a good deal of validity. It is pointed out that the sheer increase in quantity of products has imposed an enormous cost on society in the form of pollution, crowding, proliferation of wastes that need disposal, and debilitating psychological and social effects. It is said that industry has transformed the satisfying and creative tasks of the artisan into the mechanical and dehumanizing routine of the assembly line. It has dotted our roadsides with junkyards, filled our air with smoke, and poisoned our food with dangerous chemicals. The question is whether the outpouring of frozen foods, talking dolls, radios, and headache remedies is worth its high cost to society. 5. 原文：As one well-known economist put it: The continued pursuit of economic growth by Western Societies is more likely on balance to reduce rather than increase social welfare. . . Technological innovations may offer to add to men’s material opportunities. But by increasing the risks of their obsolescence it adds also to their anxiety. Swifter means of communications have the paradoxical effect of isolating people; increased mobility has led to more hours commuting; increased automobilization to increased separation; more television to less communication. In consequence, people know less of their neighbors than ever before. 6. 原文：Virtually every economist agrees that these concerns are valid, though many question whether economic growth is their major cause. Nevertheless, they all emphasize that pollution of air and water, noise and congestion, and the mechanization of the work process are very real and very serious problems. There is every reason for society to undertake programs that grapple with these problems.